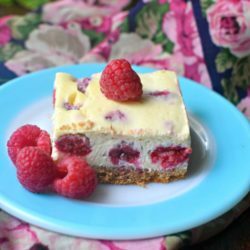 These Lemon Raspberry Cheesecake Bars are simple, delicious, and really pretty too! I hope that you enjoy them as much as my family & I do. I am so glad that Spring has finally sprung… well, technically anyway. I’m still waiting for the weather to get the whole ‘spring is here’ memo and catch up to the program a little. I am so done with all the rain and coldness that this winter brought and I could definitely use a little sunshine & warmth! 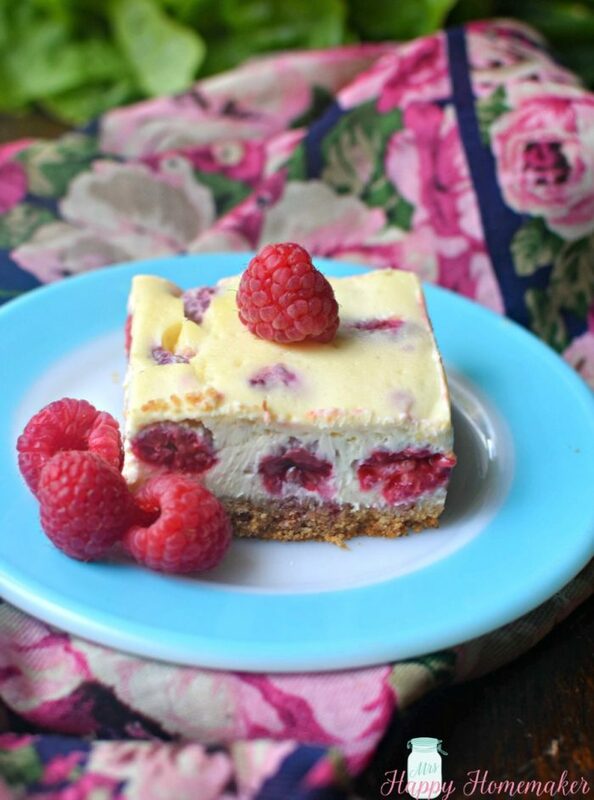 Speaking of putting a little spring in my step… these Lemon Raspberry Cheesecake Bars will definitely help with that. They are light but rich at the same time, bursting with fresh raspberries paired with the tartness of lemon. Line a 13×9-inch pan with foil, with the ends of the foil extending over sides. Combine graham crumbs, 2 tablespoons of sugar and the melted butter. Press into bottom of prepared pan. Bake 10 minutes. Beat cream cheese, lemon juice, zest and remaining sugar in large bowl with mixer until blended. Add eggs, 1 at a time, mixing on low speed after each just until blended. Gently stir in the 3 cups of raspberries; pour over crust. Bake 40-45 minutes or until the center is almost set. Cool completely. Refrigerate for 4 hours. 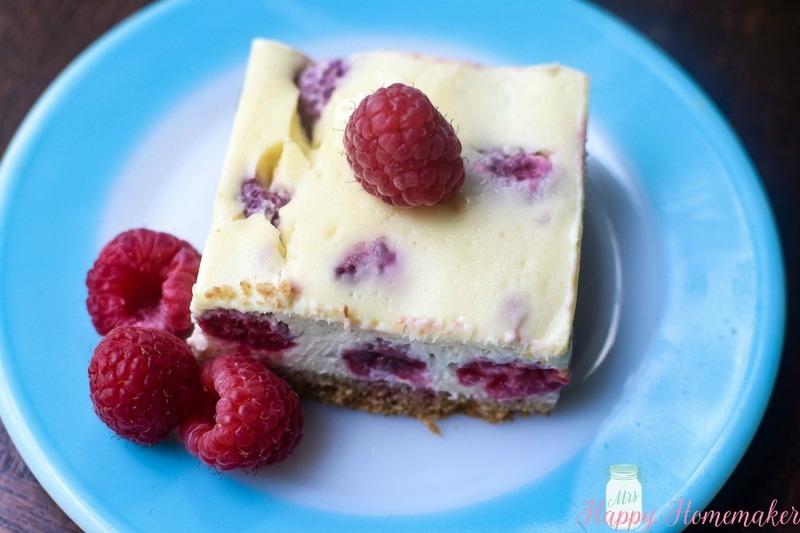 Use foil handles to remove cheesecake from pan before cutting into bars. 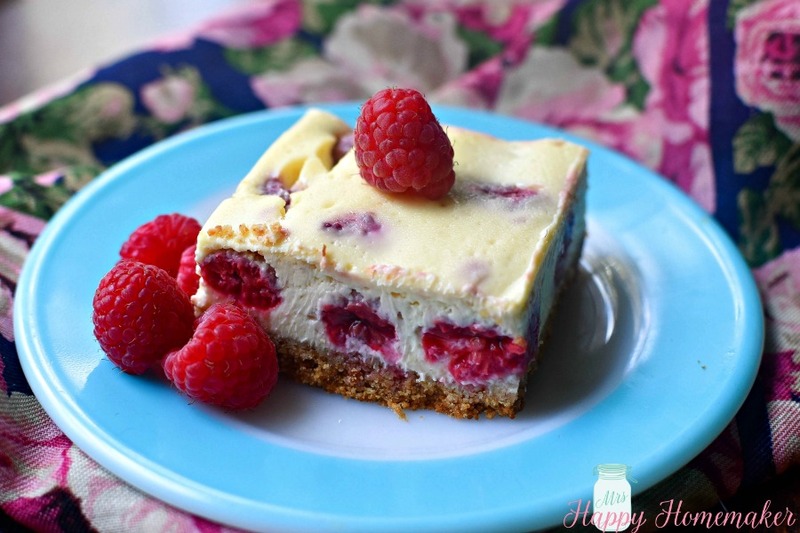 Top with remaining 1/2 cup of raspberries.